Taste test: These are another alternative to the old-fashioned Ruffles sour cream and onion chips. It's supposed to taste like a "loaded" baked potato, so you get the sour cream taste, plus it's supposed to taste like bacon has been added. Not a bad combination of flavors, but the flavoring level could stand to be stronger. 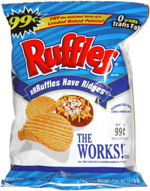 Years ago Ruffles had a bacon chip that was outstanding, it's too bad they discontinued it or merged it into this chip. 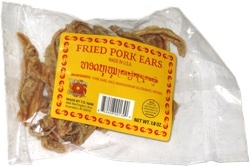 Smell test: Sort of a weak barbecue chip smell.